The other day I was looking for a particular cook book amongst my many books and found ‘Sauces’ by Michel Roux amongst them. It was published about 20 years ago and I used it from time to time over the years particularly for classic sauces. I got distracted from my original mission of looking for the other book! For dinner we were having John Dory which I’d intended to just pan-fry. Flicking through Michel Roux’s book made me want to make a sauce to go with it. As it was all a bit last minute and decided on this leek and curry sauce because I had the ingredients. It’ll be good with any pan-fried fish. Blanch the sliced leeks in boiling water, refresh and drain well. Melt the butter in a pot and add the leeks. Gently sweat for about 10 minutes. Add the curry powder and stock and simmer for 10 minutes. Add the cream and mustard powder and simmer for another 10 minutes. I tasted mine at this stage and added a touch of hot curry powder as well. Using a stick blender, whizz into smooth. Season. Keep the sauce warm without letting it boil, while you pan-fry the fish. 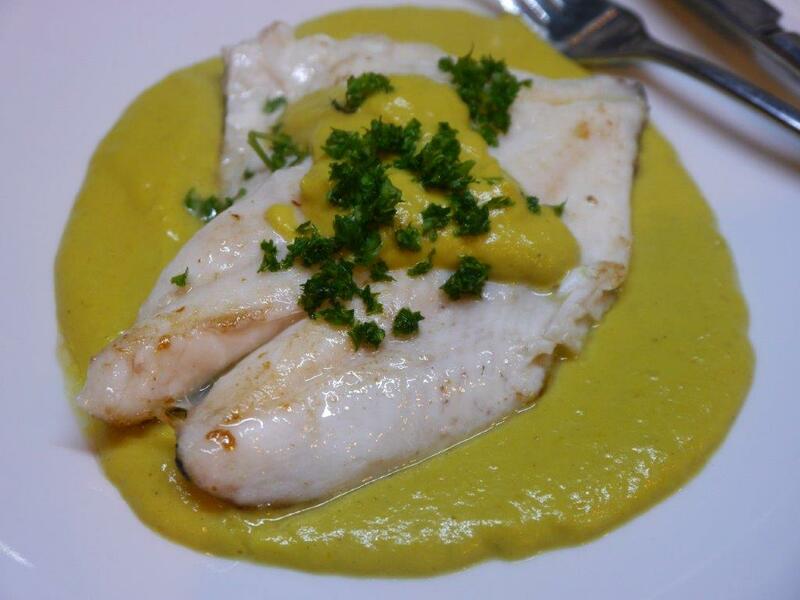 Serve a large spoonful of sauce on a plate, top with a fillet of fish and a little more sauce. Great with boiled baby potatoes and steamed broccoli or green beans.